Former two-time World champion Giorgia Bronzini will be riding alongside Great Britain’s Olympic trio of Dani King, Joanna Rowsell and Laura Trott in the new DTPC-Honda team in 2013. The British-registered team’s 12-rider line up comes together as a result of a four-year project from Commonwealth champion Rochelle Gilmore, who also joins as a rider; the team will largely focus on sprint and Classic races as the young British riders transition into the elite European peloton. As well as the track trio, the British contingent will be strengthened by recently crowned World junior time trial champion Elinor Barker, who moves up to the senior ranks, as well as youngster Amy Roberts. The British connection is completed with support from Bradley Wiggins’ Wiggo Foundation; the Tour de France winner recently described women riders as “the forgotten ones” and so is getting behind the team. Bronzini will be the team’s biggest name, whose presence - as well as UCI points - will ensure its invitation to the biggest races on the calendar. 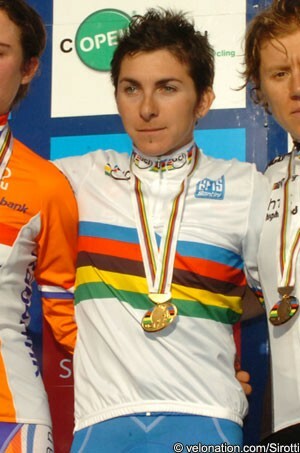 The 2010 and 2011 road World champion, who also has a track rainbow jersey from the 2009 Points Race, is one of the most tenacious riders in the sport and looks forward to racing with the new team. Bronzini will be joined by neo-pro compatriot Beatrice Bartelloni, while Gilmore’s fellow Australian Lauren Kitchen moves across after one year with Marianne Vos’ Rabobank team. The international nature of the new team is completed by New Zealander Emily Collins and three-time Japanese champion Mayuko Hagiwara - who both make their debuts in the European peloton - and German Anna-Bianca Schniztmeier. As well as her role as rider, Gilmore is the team owner and manager of Dream Team Professional Cycling (DTPC), who has brought long-standing sponsor Honda with her from 2012 team Faren-Honda, and managed to secure a raft of supporters that includes Pinarello, Vanomobil, Campagnolo, Lazer Helmets, Tacx, Hi5, fi’zi:k, and Look. The lead name rights will continue to be held by Gilmore’s DTPC parent company, since deep negotiations are ongoing with a UK-based global company. "I believe that having partnerships with companies like Honda and the Wiggo Foundation, the team can function as a truly professional organisation, making the athletes a priority and providing them with what they need in order to reach their potential," said the Australian. The team will make its debut at the Tour of Qatar, between January 30th and February 2nd, and will surely be one of the best-equipped teams in the peloton as it rolls on its Pinarello Dogma 65.1 bikes with Campagnolo Super Record EPS, and Bora and Hyperon race wheels.